This week is all about TGIT! 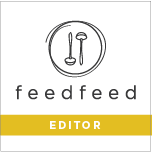 I’m excited to have teamed up with feedfeed + Simply Organic to encourage everyone to come together on Thursday evenings. The upcoming holiday season is a busy time, especially on the weekends, so why not schedule a fun weekly date with our loved ones? Sharing a meal is a universal way of bringing people together and Simply Organics wants to help us create these #ThursdayMoments. Moments where we can reconnect with one another; whether it be for a sit down dinner, game night, or to simply watch our favorite tv shows. All the while also enjoying our favorite foods. 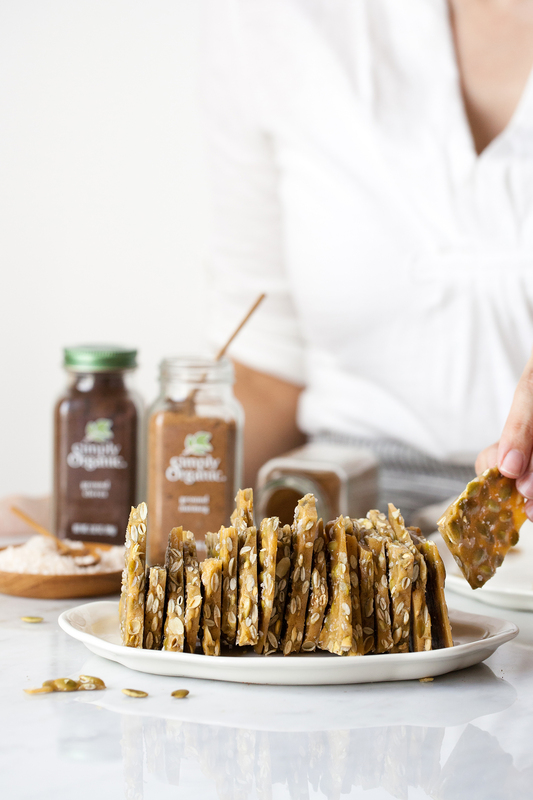 To me, no gathering is complete without a salty-sweet crunchy snack, like this Spiced Pepita Brittle. 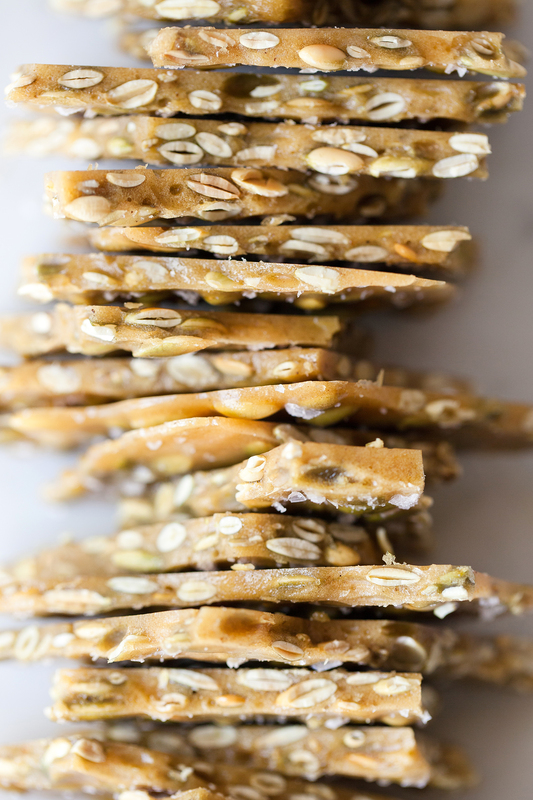 It’s a classic brittle full of Simply Organic spices and salty roasted pepitas. Break off as much, or as little, of this brittle as you want throughout the evening. It will happily satisfy that need for something ‘sweet’ without overdoing it. 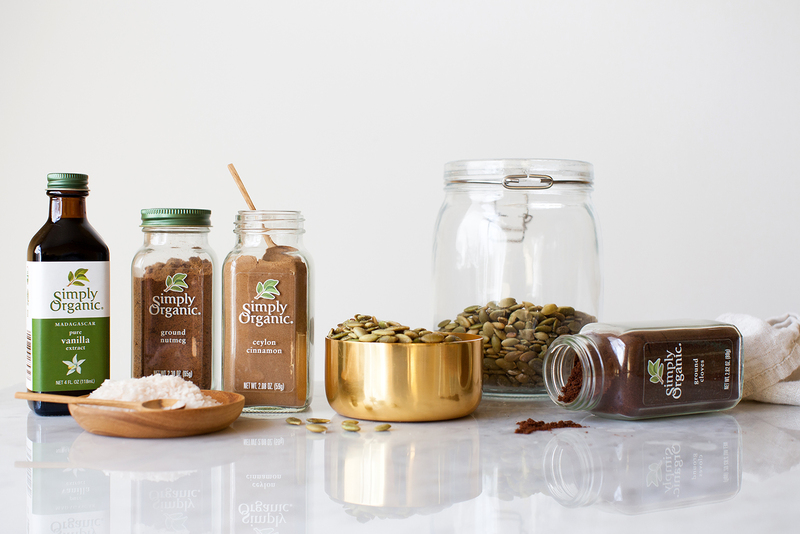 Simply Organic is a brand of 100% certified organic spices, seasoning mixes, and extracts launched by Frontier Co-op in 2001. They give back 1% of sales to support organic growers and more than $1.2 million has been donated worldwide. They’re a company that continues to engage people who are passionate about cooking and eating with purpose. This is such an important aspect to our relationship with food. Using quality ingredients and being intentional about what we choose to feed our families. It’s another way to show our love and how much we care. Creating these #OrganicMoments with them and feedfeed is a pleasure. It’s good to be reminded to slow down and make time for one another. Now, back to this Spiced Pepita Brittle. If you’ve never made brittle before, then here are a few notes before starting. First, you’ll need pepitas. A pepita is a shell-free green pumpkin seed that comes from a specific type of pumpkin, the Styrian pumpkin. 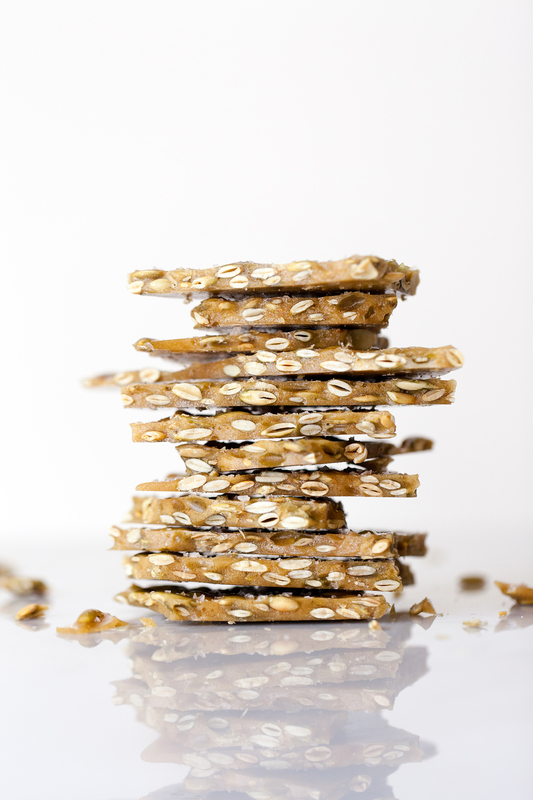 They’re great as a snack on their own, but make for a nice chewy addition to this crunchy brittle. Pepitas, both plain and pre-roasted salted, can be found at the local grocery store or health food store. Second, you’ll need a candy thermometer. Brittle is a confection that’s cooked to the hard crack stage, as it’s referred to in the candy making process, and the thermometer will help guide you along. Candy thermometers are very affordable (under $10) and readily available. As with all candy making, you’re cooking with very hot boiling sugar, so make sure to work carefully. It can help to place a bowl of ice water nearby while working, just in case a rare burn occurs (just plunge you’re hand into the ice water). Before starting, be sure to read through the recipe and have all your ingredients measured out and ready to go. Sugar cooks quickly and needs constant attention; that means no walking away from the stove or staring at your cell phone while it cooks. That way, the ingredients go in at the exact time they’re needed and are poured out at the right temperature. In the end, you’ll have a tasty salty-sweet snack for TGIT. Enjoy! Line a large baking sheet with parchment paper or a Silpat. In a small bowl, combine cloves, cinnamon, ginger, and nutmeg. Set aside until ready to use. In separate bowls, scale out pepitas, vanilla extract, and baking soda. Set each bowl aside until ready to use. In a medium saucepan, over medium-high heat, bring sugar, water, light corn syrup, sea salt, and butter to a boil. Attach a candy thermometer to the side of the pan (careful not to let it touch the bottom) and cook syrup to 280F (138C) without stirring. If needed, wash down any sugar crystals that form on the side of the pan with a pastry brush that’s been dipped in cold water. Stir in pepitas and continue to cook until mixture reaches 300F (149C). Remove from heat and immediately stir in spices, vanilla, and baking soda. Carefully, pour out onto the prepared baking sheet. Working quickly, spread out the hot mixture with a spatula, or with the back of an oiled spoon, into an even thin layer and sprinkle with flaky sea salt. Set baking sheet on cooling rack and let cool completely. 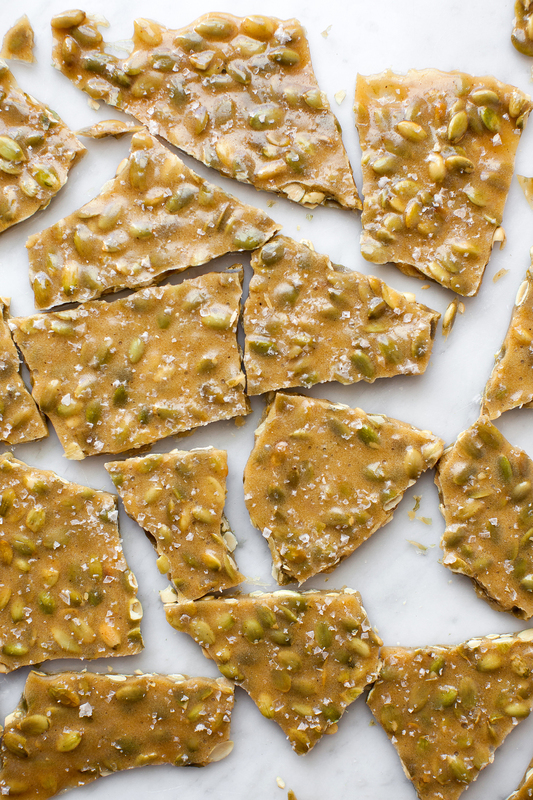 Once cool, break pepita brittle into 2-inch sized pieces. Store brittle, in single layers separated by sheets of parchment paper, in an airtight container at room temperature. Brittle will keep for up to two weeks. *Disclaimer: This post was sponsored by Simply Organic and feedfeed. All opinions and thoughts are my own. 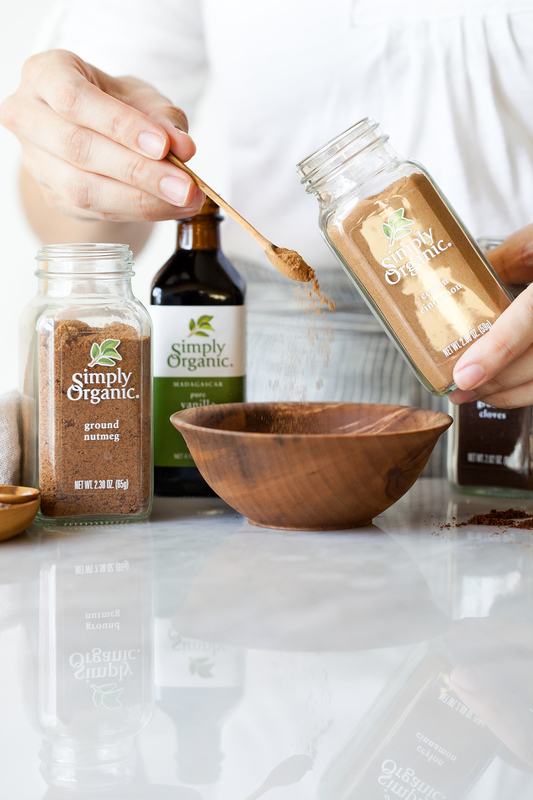 A big THANK YOU to Simply Organic for their generous provision of spices and extracts to create this recipe and post! Visit Simply Organic to find more ways to plan your #ThursdayMoments and enter the Ultimate #ThursdayMoments Giveaway. As usual impeccable pictures, and such a beautiful recipe to bring people together on Thursdays. I love this concept and we do need to take time for our families and spend it together over food. Love the concept, and such a well written piece! I know it comes from your heart! Bravo! Thank you very much, Amisha! The #ThursdayMoments concept really resonated with me as well. Life is busy and it’s easy to become disconnected, so being intentional about coming together weekly is special. Especially when it involves food. :D Enjoy the rest of your week with that sweet family of yours (cats included)! This brittle looks so good, I love how light the photos are as well! Gorgeous. Just gorgeous, your brittle is stunning and would make such a fabulous holiday gift! Hi Laura, thank you! You’re right, it would make for a great holiday gift. I’m excited for the season to begin! Absolutely stunning photos! I love the combination of ingredients in this recipe, I will definitely be giving this one a try! Lauren, you are the sweetest! I always appreciate you stopping by. :) Thank you & enjoy!